Kick Off the Week with Crafts and a Great Pillow Sewing Tip! First up, congrats go out to Marybeth P. of Marshalltown, IA. She is the winner of our big Zentangle giveaway that included the soon to be released Tangle Stitches for Quilters and Fabric Artists: Relax, Meditate, and Create with Rhythmic Stitches by Jane Monk. And if you are planning on making some new pillow covers for the summer, or even looking ahead to fall check out this great tip for preventing "dog ears" on your pillow corners. The knife-edge pillow is the most basic of pillow styles. At its simplest, it is two matching fabric panels sewn together around their perimeters and slipstitched closed after the pillow form is inserted. But it can be so much more! Think of this basic style as a blank canvas for creativity—you can piece the panels with contrasting fabrics, add welting, a ruffle, or trim to the edges, add interesting closures, or tuft the finished pillow. These pillows can be square, rectangular, round, or shaped in a creative design, and stuffed with purchased pillow forms or with polyester fiberfill. Because the center of the pillow is thicker than the edges, square and rectangular knife-edge pillows tend to develop “dog ears” on the corners. You can stuff the corners lightly with fiberfill to minimize this look, or avoid it altogether with the corner tapering technique described in steps 2 to 4, as follows. 2. To taper the corners, fold the front panel into fourths. Mark a point halfway between the corner and the fold on each open side. At the corner, mark a point 1/2" (1.3 cm) from each edge. Draw a line connecting the points. 3. Cut along the marked lines, cutting through all four layers of fabric. 4. Unfold the front panel and use it as a pattern for trimming the back. Learn how to make slipcovers to fit all different styles of furniture with The Complete Photo Guide to Slipcovers, Pillows, and Bedding. From making simple seat cushions for wooden chairs to complicated covers for sleeper sofas, this comprehensive, how-to reference covers all the options and teaches all the essential skills. Readers can easily access information with step-by-step directions and hundreds of color photos for clear understanding, and inspiring home interior photography shows slipcovered furniture pieces in real home settings. Karen Erickson has been engaged in the home decor interior industry for more than 20 years. In 1986, she started Fine Finishing by Karen as a part-time home based business designing and fabricating draperies, slipcovers and other fabric accessories. In 1998, her company became a corporation with a name change to Slipcover America, Inc. (http://www.slipcoveramerica.com). She has worked with designers, decorators and retail customers throughout the United States, specializing in on-site fabrication (in customer’s homes). Karen instructs both in the U.S. and Canada doing seminars and workshops at fabric stores, for sewing guilds, in professional workrooms, and at numerous trade show and groups. In January of 2007, she partnered with Claudia Buchanan of Sew What! to start http://www.HomeFashionsU.com. She lives in Snohomish, WA. Meditative Quilting? Learn Tangle Stitches and Enter Our Zentangle Giveaway! Tangle Stitches for Quilters and Fabric Artists: Relax, Meditate, and Create with Rhythmic Stitches by Jane Monk. Enter this giveaway here and then scroll down for a free stitch pattern from the book! Wondering about what's inside of this amazing new book? I have chosen a mixture of patterns to show you how to draw them. The pattern directions are commonly known as step outs. They show you how to create each individual step to make the whole pattern. Some of these patterns are official Zentangle® patterns. The patterns that are marked with an asterisk are those I have created and named myself. Once you get started you will discover ways to change patterns to suit your style of drawing and add your touch, or even create your own unique patterns. Although most tangle patterns can be stitched, many would require multiple stops and starts. I have included a mixture of patterns, both simple and more complex. Some of the patterns have a more fluid design that will need only minimal stopping, starting, and backtracking while being stitched. When stitching, some elements of the individual patterns can be eliminated, such as the dots in the pattern Msst or the colored sections in the patterns Crescent Moon and Chartz. You can add these elements in with a black fine-point pen, if you wish. I recommend drawing any pattern on paper a few times before you start stitching. This makes it easier to stitch smoothly with the machine, and your brain will remember the sequence much more readily if you have practiced first. Let’s look at those tangle patterns. Free-motion quilting in repetitive patterns is not new to quilters. They have long used stitch patterns like "vermicelli" and "echo" stitching to quilt their projects. The projects can be achieved on either a domestic (conventional sit-down) sewing machine or longarm quilting machine. Jane Monk lives in Tasmania, Australia. She is a self-taught artist who has been drawing since she was a young girl, inspired by the beauty in all things in the natural and man-made worlds. Patterns and repetition; the sometimes quirky and different; are what inspire her work. Jane began quilting in 2003 and loved it so much she purchased a longarm quilting machine in 2007. Jane is an award winning machine quilter and quilts professionally for others in her business "Jane Monk Studio". Today's giveaway is all about sewing! And along with today's giveaway of 4 sewing books and supplies, there is a great tip about sewing tiny triangles on your top-stitched patch pocket to make them sturdier from the book First Time Sewing: Step-by-Step Basics and Easy Projects. -First Time Sewing: Step-by-Step Basics and Easy Projects by the Editors of Creative Publishing International. -The Complete Photo Guide to Slipcovers, Pillows, and Bedding by Karen Erickson and Carol Zentgraph. -The Complete Photo Guide to Window Treatments, 2nd Edition by Linda Neubauer. -Easy Singer Style Pattern-Free Home Accents: 15 Easy-Sew Projects that Build Skills, Too by Becky Hanson. -Gütermann thread - 7 spools of 100% recycled rPET polyester thread in pastel colors. -3 pretty Belle Buttons by Dritz. Along with today's giveaway I want to share with you a fun tiny detail from First Time Sewing. If you sew things with patch pockets, check out this little triangle detail that will make them pretty and sturdy. -With a pencil or erasable fabric marker, draw a small triangle in each upper corner of each pocket, 1⁄8 " (3 mm) from the top and side edges. -Place the skirt under the presser foot with the top of the pocket toward you, aligning the needle to start sewing at the lowest point of the triangle. -Stitch forward two stitches, then backstitch two stitches. Now stitch diagonally to the top, pivot, and stitch a few stitches across the top of the triangle. -Pivot again so the needle is now aligned to stitch down the side of the pocket. -Edgestitch around the sides and the bottom of the pocket, and finish with the triangle on the opposite corner, again backstitching two stitches. -TIP: Apron pockets are used frequently. Stitching triangles at the top corners reinforces them better than merely backstitching, which can put more strain on the skirt fabric beneath the pocket. First Time Sewing: Step-by-Step Basics and Easy Projects from the Editors of Creative Publishing International. Learning how to sew has never been simpler! Enjoy this beginner's guide that takes you by the hand like a personal instructor and teaches you how to sew using hand stitches as well as sewing machines. Filled with detailed descriptions of materials and tools, the easy step-by-step instructions for all the basic sewing techniques will have you creating projects like aprons, pillows, and even pants and shorts in no time. Five simple projects will introduce sewing skills like hems, seams, balancing tension, and how to use a pattern; skills you will use often as you continue to learn. With First Time Sewing, soon you will be stitching amazing gifts and projects with confidence. I was reading a trend report in the Craft Industry Today magazine, and the title was "Chevron is the New Black." I agree. I have been seeing it everywhere, including this cool tutorial on how to make zigzag trim with ribbon from the book How to Make 100 Ribbon Embellishments: Trims, Rosettes, Sculptures, and Baubles for Fashion, Decor, and Crafts. I think this chevron trim would look cool when made with all sorts of ribbons, and would be fun to use to embellish all sorts of things. 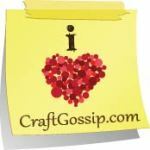 Classic and contemporary crafters unite! Create amazing trims, butterflies, flowers and more with How to Make 100 Ribbon Embellishments. With clever techniques and a huge selection of ribbon styles to choose from, the timeless art of making ribbon embellishments is better than ever. Let author Elaine Schmidt take you through 100 ribbon designs, offering helpful hints and tips to help you make beautiful accessories to place anywhere. Inexpensive, and with so many patterns and colors, ribbon is the perfect medium to create adornments that will make any gift, card, or decoration unique and special. Enjoy beautiful photos and simple step-by-step instructions that allow you to create amazing ribbon crafts with ease. So grab some ribbon and get crafting today! Elaine Schmidt is a designer, consultant, educator and spokesperson in the sewing, quilting, craft and hobby industries. Since she was a little girl, she has always been busy creating something. Her love of sewing and weaving led her to major in Textiles and Design at Carnegie Mellon University. She has worked in the education and design departments of a major sewing pattern company and is the former design director for a national chain of ribbon boutiques. As the owner of Elaine Schmidt Designs (http://www.elaineschmidt.com), she has developed award-winning products for many manufacturers. Her original designs are featured at trade and consumer shows and in books, magazines, project sheets, and TV segments. She lives in Long Valley, NJ.